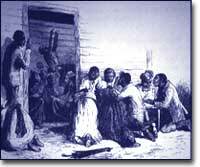 Both blacks and women began to participate in evangelical revivals associated with the Second Great Awakening at the end of the 18th century. From these revivals grew the roots of the both the feminist and abolitionist movements. 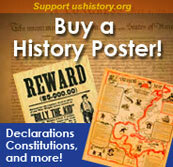 The American Revolution had largely been a secular affair. The Founding Fathers clearly demonstrated their opposition to the intermingling of politics and religion by establishing the separation of church and state in the first amendment to the Constitution. In part because religion was separated from the control of political leaders, a series of religious revivals swept the United States from the 1790s and into the 1830s that transformed the religious landscape of the country. Known today as the Second Great Awakening, this spiritual resurgence fundamentally altered the character of American religion. At the start of the Revolution the largest denominations were Congregationalists (the 18th-century descendants of Puritan churches), Anglicans (known after the Revolution as Episcopalians), and Quakers. But by 1800, Evangelical Methodism and Baptists, were becoming the fasting-growing religions in the nation. The noise was like the roar of Niagara. The vast sea of human beings seemed to be agitated as if by a storm. 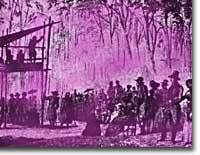 I counted seven ministers, all preaching at one time, some on stumps, others on wagons ... Some of the people were singing, others praying, some crying for mercy. A peculiarly strange sensation came over me. My heart beat tumultuously, my knees trembled, my lips quivered, and I felt as though I must fall to the ground. This young man was so moved that he went on to become a Methodist minister. As this quotation suggests, evangelical ministers reached their audience at an emotional level that powerfully moved large crowds. 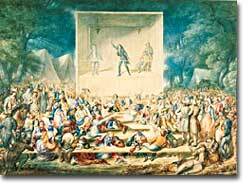 In 1839, J. Maze Burbank presented this image to the Royal Society in London with the caption: "A camp meeting, or religious revival in America, from a sketch taken on the spot." The evangelical impulse at the heart of the Second Great Awakening shared some of the egalitarian thrust of Revolutionary ideals. Evangelical churches generally had a populist orientation that favored ordinary people over elites. For instance, individual piety was seen as more important for salvation than the formal university training required for ministers in traditional Christian churches. The immense success of the Second Great Awakening was also furthered by evangelical churches innovative organizational techniques. These were well suited to the frontier conditions of newly settled territories. Most evangelical churches relied on itinerant preachers to reach large areas without an established minister and also included important places for lay people who took on major religious and administrative roles within evangelical congregations. Religion was a central theme of the 1830s; American Protestants branched off into many different denominations, holding in common the need for meetings and revivals. The Second Great Awakening marked a fundamental transition in American religious life. Many early American religious groups in the Calvinist tradition had emphasized the deep depravity of human beings and believed they could only be saved through the grace of God. The new evangelical movement, however, placed greater emphasis on humans' ability to change their situation for the better. By stressing that individuals could assert their "free will" in choosing to be saved and by suggesting that salvation was open to all human beings, the Second Great Awakening embraced a more optimistic view of the human condition. The repeated and varied revivals of these several decades helped make the United States a much more deeply Protestant nation than it had been before. Finally, the Second Great Awakening also included greater public roles for white women and much higher African-American participation in Christianity than ever before. Why did so many people flock to evangelicalism in the early 19th century? The Second Great Awakening was more than just a religious movement; it provided a new social outlet. There was an excitement to it, and a sense of belonging. People even changed denomination if they felt one preacher was more interesting than the last. This essay puts a social twist on early evangelicalism. No matter whether they were saints or sinners, they would be taken under a warm song or sermon and seized with a convulsive jerking all over, which they could not by any possibility avoid... -from Autobiography of Peter Cartwright. What were revivals really like? Find out from someone who was there! Peter Cartwright was about 16 years old when he went to the Cane Ridge Camp Meeting. He went on to become a Methodist preacher and lead his own revivals. What makes Methodism different from other Christian denominations? Find out at the homepage of the United Methodist Church. Jonathan Edwards was a big name in the First Great Awakening, which began in the 1740s. His writings were also instrumental in the Second Great Awakening, more than 30 years after his death.